This morning the Avimor Bird Guy and his family took advantage of the kids being out of school and dad taking the day off work to go up to the Idaho Bird Observatory. Once again it was a great delight to see these wonderful birds in the hand. The staff were really great with the kids too by making them feel involved in the whole process. Birder or not, anyone will be impressed and amazed at the IBO. 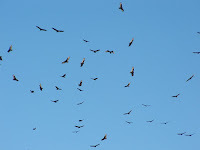 * A huge kettle of Turkey Vultures made a cloud over the camp. The hawk watch crew estimated 200 of them. I think my wife and kids really enjoyed the morning. I also got to meet Harry Krueger and his son. It's always nice to meet the folks you see posting online about Idaho birds. The only downside of the day was that my recently replaced brakes on my old Dodge Dakota went out on the way down the mountain. I try to avoid using brakes in situations like this by using really low gears and letting the engine slow me down. For whatever reason, they went out this afternoon. We made it safely to Big O' Tires in Eagle by down-shifting to stop. Ah, the joys of outdoor adventures!